The Aam Aadmi Party is banking on its governance record and perceived "goodwill" in the slum clusters to retain the Bawana seat, reserved for scheduled castes, in the bypoll to be held on August 23. Gopal Rai told reporters that AAP was confident of pulling off a victory this time around. New Delhi: The Aam Aadmi Party is banking on its governance record and perceived "goodwill" in the slum clusters to retain the Bawana seat, reserved for scheduled castes, in the bypoll to be held on August 23. The Assembly by-election comes as an opportunity for the Arvind Kejriwal-led party to redeem its pride following a string of poll upsets, infighting and a conscious decision to tone down its rhetoric against Prime Minister Narendra Modi. The bypoll was necessitated due to AAP MLA Ved Parkash quitting the assembly to rejoin the BJP before the municipal elections, which had come as a major setback to the party. 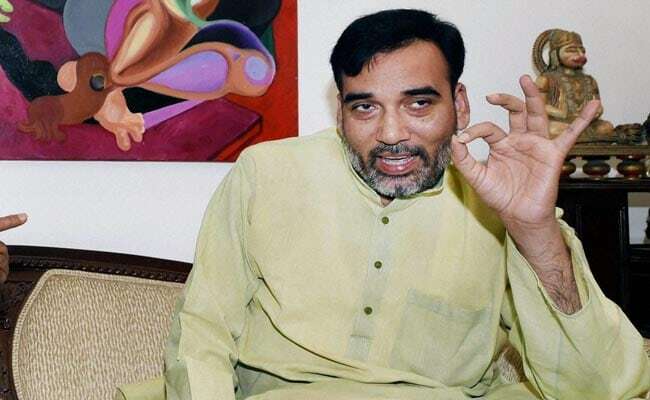 Delhi Labour Minister Gopal Rai, the party's Delhi convener, told reporters that AAP was confident of pulling off a victory this time around, also due to "public resentment" against Mr Parkash, who is now contesting on a BJP ticket. A senior AAP leader, who did not wish to be named, said the northwest Delhi constituency of 3.5 lakh voters, is dotted with jhuggi clusters, the biggest of which is the Shahbad Diary. Interestingly, the party's candidate Ramchandar is a resident of one such JJ cluster. "Now our initiatives like lowering of power tariff, free water, laying of sewer lines, enhancement of pensions have benefited people living in JJ clusters more than anyone else. And around 2.5 lakh voters in this constituency are residents of JJ clusters," the leader said. The constituency also has around 26 villages. Of late, the AAP has been pushing for expansion of its base in rural areas. The Bawana constituency has a substantial Jat population, who traditionally vote for the BJP. To make its presence felt in the rural blocks, the AAP is forming committees, comprising village elders and prominent faces of an area, which will be "empowered" to spend funds alloted to the village development board. "Our strength lies in the JJ blocks. But we are focusing on the villages as well. The BJP has good organisational presence there while the Congress candidate Surendra Kumar, who is a three-time MLA, is quite popular. So the fight is triangular in the villages," the AAP leader said. In this regard, the recent induction of former BJP MLA from Bawana, Gugan Singh, in the AAP is being seen a setback for the saffron party which had won the seat in 2013, before losing it in 2015. "Parkash's decision has not gone down well with the locals. In that sense, the BJP is in a situation in which we were in at Rajouri Garden bypoll, where we could not give a plausible explanation as to why Jarnail Singh was made to quit the seat to contest polls in Punjab," said another AAP leader, not willing to come on record.